Nafziger Family Chiropractic has been delivering quality chiropractic care to the Archbold, OH community since 2006. 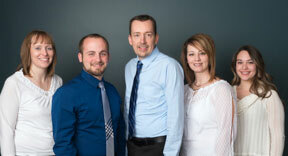 The team of Nafziger Family Chiropractic in Archbold welcome you! Nafziger Family Chiropractic exists to first help our patients achieve their immediate health goals, but then guide them on a journey toward “wellness”. You see, chiropractic is really about restoring the integrity of your nervous system, so you can be 100% you! As a Archbold, OH chiropractor, I believe in the body’s inborn ability to heal itself, and we know that’s a new concept to many people. It is our goal to help people achieve optimal health…physically, emotionally, and spiritually. We are not the typical chiropractor in Archbold — our office is not just a “Chiropractic office”, but a place that people can believe in, have hope, and feel comfortable sharing their healthcare needs and life decisions for themselves and their children. We value and appreciate all of our patients. The excellence in our care is a reflection of our appreciation and gratitude to those who have put their faith in us. We strive to be available, and do our best to provide both same and next-day appointments. Secondly, we are sensitive to our patient’s concerns or fears. We understand not everyone is accustomed to chiropractic care. We also recognize that there are many misconceptions about chiropractic, so we encourage dialogue between our patients and our front desk staff, as well as Dr. Randy to help make our patients visits less “nerve-racking”. Dr. Randy is originally from Waldron, Michigan, about 30 minutes northwest of Archbold. After spending 5 years away from family in Iowa, he and his wife decided to move closer to home so their children could be closer to their grandparents and cousins. “Archbold was an easy choice to raise our children because of its small town atmosphere and close-knit community,” declares Dr. Randy. If I had a magic wand, when it comes to the health of the Archbold, I would see every man, woman, and child in the community be under regular chiropractic care (once or twice per month), taking less prescription medications, eating healthier (more fresh fruits and vegetables), and having more meaningful relationships with their families. Chiropractic is a way of life for Dr. Randy and his family. Everyone in his family is adjusted on a weekly basis to keep their bodies healthy physically, mentally, and emotionally. BUT we understand that most people don’t know that chiropractic is more than just neck and back pain. So we meet you where you are; we’re here to help you feel better, but along the way help you understand more about chiropractic and how it may help you and their family. Sound interesting? Please contact our Archbold practice to make an appointment and let us get to know you and your family better.